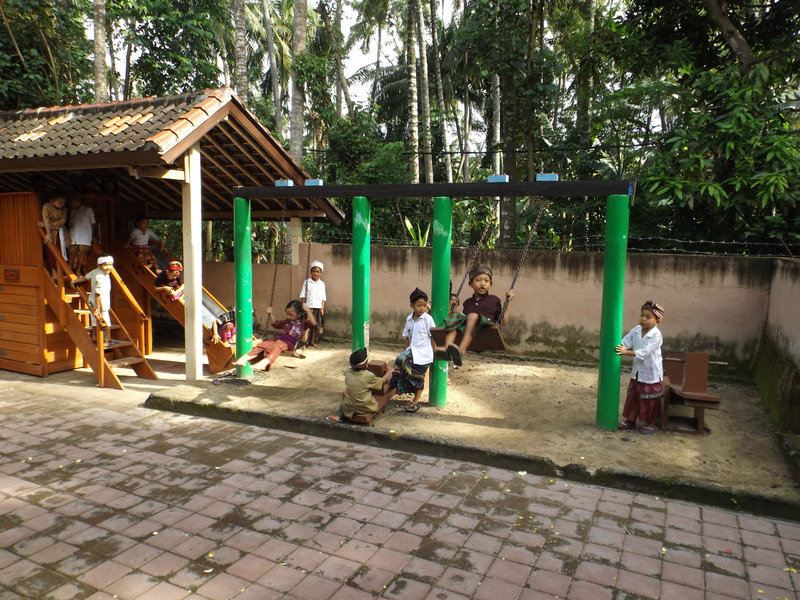 In November, 2014, Eleni Seitis travelled to Bali to have her first overseas holiday and to work with severely disabled children at a school called Jembatan Senang. This school was opened 7 years ago by Kees and Els Sinjorno using donated funds. 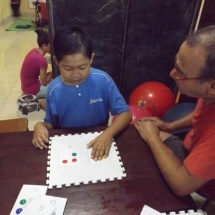 Kees is a retired schoolteacher from the Netherlands specialising in special needs teaching. He saw there was a need for severely disabled children in Bali to have access to schooling that would otherwise be impossible for these children. In Bali, as in many countries, being born with a disability, birth defect or acute illness means the children often do not receive much needed medical help that could vastly improve their health and lengthen their lives. Many children die soon after birth due to complications and the lack of immediate medical assistance. Medical procedures and medicine are very costly and far beyond the reach of many families. Added to this is the stigma of having a child with a disability – it’s considered ‘bad karma.’ The children are kept behind closed doors. They are fed, clothed, cleaned and often left alone while the parents work close to home on the farm. They may have stimulation from the parents or other family members, though certainly less than they require. The parents lack of knowledge about an ailment creates a less than desirable life for these unfortunate children. It is only due to the ceaseless work done by concerned citizens, like the schoolteachers at Jembaten Senang that these children have an opportunity to have an introduction to education, life and social skills that would otherwise be denied them. There was one young boy that Eleni worked with on her first visit to Bali, Gede, who had been deprived of oxygen during his birth. This resulted in cerebral palsy, small body frame and diminished working capacity to his internal organs. Over the years, he never walked, only crawled in a disjointed way as his limbs were contorted. He couldn’t speak. He attended Jembatan Senang School for the first time at age 12. Since being at the school for four months, he had been having weekly physiotherapy sessions. These sessions were very painful for Gede as his limbs had been held stiffly since birth. Some increased flexibility and mobility was noticeable. Eleni worked on Gede only once with the ES Healing technique. He could move his arms and legs a little more freely afterwards. And he was more alert during class. Eleni went back to Bali in March 2015. She invested two weeks at the school working on many children. The results were outstanding. The children were gaining greater use of their limbs, moving more freely, and improving in their cognitive learning ability. Gede, whom Eleni hadn’t seen since three months prior, was now using his arms freely, without tightness and with increased muscle tone. He directs and leads the other students during the class, and he can speak three languages (Indonesian, Bahasa [Bali language] and English). The changes to Gede from that very first session with Eleni was miraculous. Another of the children, Ketut Ari, had been going progressively blind due to diabetes, which hadn’t been diagnosed till he was six years old. He is now 10years old. 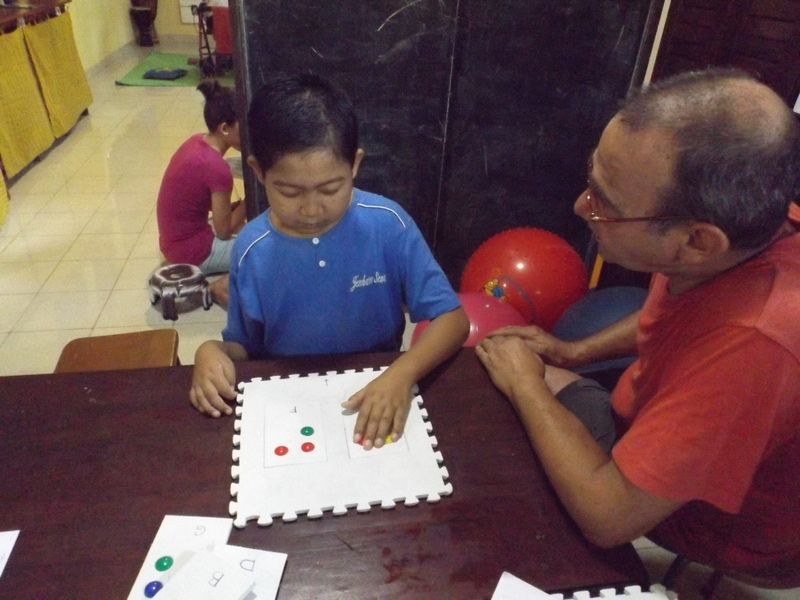 One of the teachers, Roy, was teaching him Braille by means of special foam boards he’d made himself. Eleni, who has been legally blind since birth, offered her white cane to Ketut Ari so he could have greater independence in getting around, as previously he had to be led everywhere. Days at home were spent sitting in one spot until someone comes and leads him to where he needs to go. It is a very isolated and lonely life. Ketut Ari was delighted to be given the freedom to move freely around his home and school environment by having the white cane. Eleni also taught the teachers, parents and volunteers some of the moves and exercises to assist the children. A more permanent solution was required to teach the technique and sustain the continuation of the therapy performed on the children.